We're 4,000' over the cold, cold, Pacific on an IFR flight into Monterey (KMRY) from Oakland (KOAK), about fifteen or twenty miles out from the airport itself, cleared direct MUNSO, the ILS 10R approach outer marker / LOM. As a result of an earlier ATC-initiated descent for traffic, we're a few thousand feet lower than I'm used to at this stage, but nothing truly out of the ordinary. There's a pretty solid coastal stratus layer below us; I'm estimating tops are about 2,000', but I'm not sure; Monterey ATIS is saying the ceiling is something like 800' overcast (I don't remember the details, but whatever it is it's pretty typical for a late summer / early autumn morning 'round here). The scene is beautiful — we're in bright sunshine, the various rugged mountain ranges around the Bay Area and Monterey are clearly visible poking through the stratus or further off across the landscape, and the stratus layer itself is one of those classic benign-looking fluffy-topped layers that's probably only a thousand feet thick. Just as I'm admiring the view and reviewing the ILS 10R approach I've set up on the G1000, the NorCal Approach controller tells me to descend and maintain two thousand feet. Hmmm, I say to my safety pilot Evan, this is a new one on me. Two thousand feet this far out… way out over the ocean? And it's likely to leave us in the murk almost the entire way to the final approach fix (not that I'm complaining about that). My (by-the-book) response to the controller apparently comes across as so skeptical that he responds again with "83Y, two thousand feet, correct" (or maybe it was my accent). So I start us down by programming in a slowish 600 feet per minute descent on the autopilot, and look over at Evan. Hey, how well can you swim? I ask him with a grin. There's sharks down there. And it's bloody cold. If one doesn't get you before you swim the ten miles to Santa Cruz or Moss Landing, the other one will. I watch the top of the stratus layer rise up towards us until, just as we're about to hit it, we level off at 2,000 feet. I'm about to put on the cone of stupidity when I think "bugger that! This looks so cool…" and put the hood aside. And the next five minutes or so are just magic — one of the most visually enjoyable vectors-to-the-localizer I've done in years. We dip in and out of the layer as it rises in soft-looking waves up and over us and back down, the tops being roughly our altitude, and the alternation of sunshine, blue sky, almost unlimited horizontal visibility, and blinding white waves around us is really cool. The controller asks us for best forward speed to the final approach fix as he has faster traffic behind us. I briefly wonder whether having us this low that far out was an attempt to let the faster traffic overtake us a few thousand feet above us, but I let the thought go as I get preoccupied with actually approaching the approach. Due to the coastal stratus and fog, this is one of the few airports I regularly fly to where you may have to go missed at ILS minimums on days when it's benign clear weather even ten miles inland (or a thousand feet above you), and I have the missed approach procedure burned into my brain. Nonetheless, I look over it several times again just to be sure; there's a lot of terrain around here you just don't want to hit…. As we get closer to the ILS, the layer rises up completely around us, and we intercept the localizer and turn in towards the outer marker deep in the now dark grey murk. This I like, of course, and the air's fairly still and the plane predictable, making for an easy approach. We intercept the glideslope a little early and start on down, still in the murk. I predict we'll break out somewhere just past the outer marker, and it'll be one of those weirdo abrupt Monterey break outs that's more horizontal than vertical due to the cloud layer sometimes ending suddenly around the coastline. I slow us down at MUNSO, the outer marker, and start mentally preparing for the landing itself. There's a mild quartering tailwind, and I don't want to blow the landing in front of Evan or any observers on the ground. Tower clears us to land, and the approach and runway lighting slowly become visible through the windshield as the stratus starts clearing patchily around us. We break out fully well past the coastline, quite a bit further past the outer marker than I'd predicted, and softly rather than abruptly. So much for predictions, I guess. But it's always really cool to watch the runway lights slowly appear in the right place in front of you at times like this, I have to admit. The landing's pretty routine, and since I have this nagging mental image of a Citation or Gulfstream or something like that barreling down the ILS just behind us in the greyness, I turn off 10R at the first taxiway, trying not to rip the tires off or brake too hard. And now for the next Big Challenge: where to park. Evan and I have been pondering this the entire way down, as we want to get both fuel and coffee, and I haven't actually used an FBO here for years (despite all the approaches and landings I've done here) — and Evan's apparently never actually done a full stop landing here at all. There used to be a transient parking area on the south side ramp near the tower, and what my Blue Book tells me is a Chevron self-serve pump in the same area, so we decide that's where we'll go — we can get coffee in the main airline terminal building (there's a security gate you can usually get through). 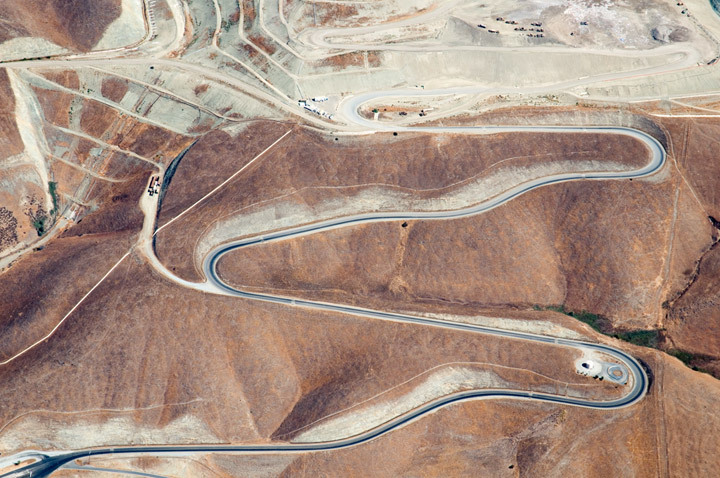 But when I tell ground we're going left to to transient, he tells me there's no transient parking at Monterey any more — we can either go right to Del Monte Aviation or past Del Monte to Monterey Jet Center. Hmmm, I think, that doesn't sound so good — the last time I was at Del Monte (building complex hours years ago in the Arrow) it was an expensive place full of jet drivers with stripy epaulets. And the Jet Center's likely to be even worse…. But what the hell else can we do? It's still IFR, we need fuel, and I could really do with some coffee (and bagels if there's any such thing down here). Oh well. I tell ground we'll do Del Monte, and turn right on taxiway alpha. Just as I'm reaching for the Blue Book to see what UNICOM frequency is here, a Del Monte guy strides out on to the ramp and starts waving us into the corner parking lot, and a few seconds later I've signed up for twenty gallons of Avgas. As we wander into the rather nice-looking old Del Monte building to do the paperwork, we can see what looks like a King Air breaking out on the ILS over towards the coastline. I'm still not sure what the rush was, if that was our traffic. But who cares? It's coffee time…. 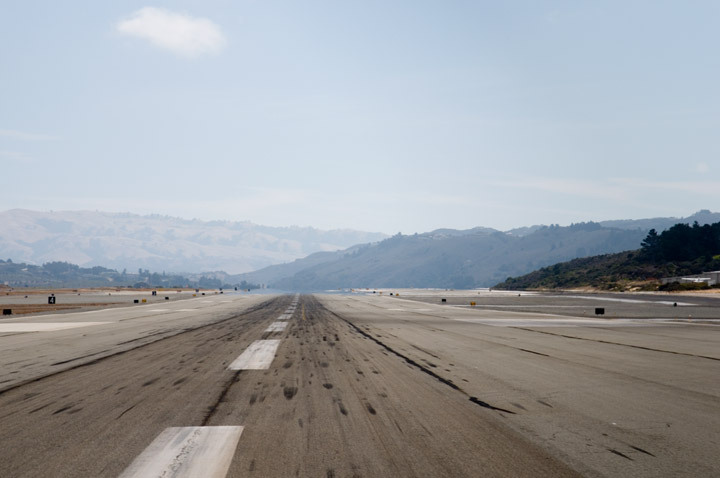 The view along KMRY runway 10R on departure (note the terrain in the middle distance, itself hiding much higher peaks a little further along and to the right…). This is actually Evan's first IFR flight as a certified instrument pilot. The original plan is to do a day trip much further down the coast to San Luis Obispo (KSBP) for lunch, maybe getting a few approaches and holds and whatnots in wherever, and just generally admire the view (if you do the coast route past Big Sur, the view's spectacular). But that plan falls through late in the day when Cessna 051 is delayed coming back off a 100 hour inspection, and instead we're only able to take Cessna 83Y (the club's other G1000-equipped C172) for a morning trip IFR to Monterey and back. The weather at both ends is light IMC, so we're going to need real clearances and some real-world IFR flying. It's clearing quickly here now at Monterey (within a few minutes of landing it's basically clear to the east and marginal VFR in the other directions), and we sort of expect Oakland to be VMC by the time we get there, but my ForeFlight iPhone app is reporting that Oakland is still IMC. In any case, Evan decides he's going to file a real IFR flight plan, and starts using his own iPhone to file. I wander off to find the coffee, which turns out to be not too bad for machine-made stuff, but I can't see any bagels or cookies or anything. The counter staff are too busy handling the King Air's passengers (a family of four or five) and fuel to ask, so I walk back outside to the entrance area. The King Air's right outside, and the pilot's hanging around talking to another passenger. 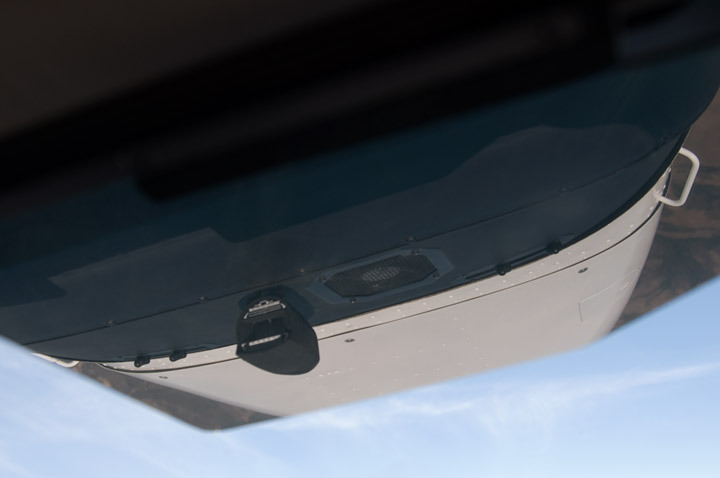 He looks over at me and nods, so I introduce myself and tell him I was flying the tiny slow Cessna in front of him on the ILS — hope I didn't cause any problems…. 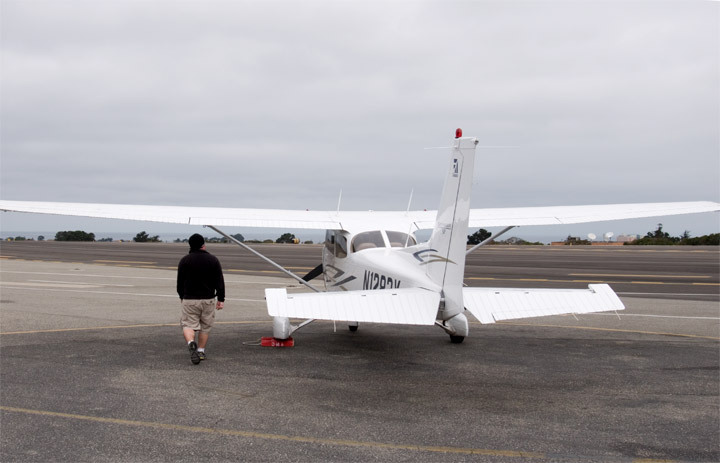 We spend the next five minutes or so talking — he's a friendly guy about my age, based in Palo Alto doing charters and private flying, and we spend a few minutes bemoaning fuel costs and the dearth of flying opportunities for potential pilots these days. He says he had to slow down to 140 knots before the approach because of us; we both laugh — 140 knots is about what our little 172 could do in a dive at full throttle. But then I didn't use forty-something gallons of Jet A just to cross the Santa Cruz range, did I?! He grins and says something like if he wasn't being paid he'd probably do it in a tiny 150. I go back in (it's still quite cold out there on the ramp) and find Evan. He's filed his flight plan and got some coffee, and we lounge around the lounge for a while. According to several flyers and posters around us, the Thunderbirds are in town next week (or rather, the airshow's at nearby Salinas (KSNS), but they're normally actually based at Monterey for the duration). A few years ago I once landed at Monterey on 28R (the smaller runway) while various massed Thunderbirds did the overhead break and formation landing on the left. Way cool. Especially when the leader ironically saluted us as he taxied past in a cloud of dust, burnt jet fuel, and fumes (dammit, that's what I want to do when I grow up!). Pity I won't be in town for the Thunderbirds this time — I always seem to miss them… (as a kid my parents took us to airshows at RAAF Richmond (I think it was) several times, and I always really enjoyed that). At least I get to see (and hear) the Blue Angels locally during Fleet Week. Our plane's been refueled, so I go back to the front desk to sign the bill. The staff there are friendly, efficient, and funny, and one of them does a dead-on "oh mahvelous!" in imitation of my Anglo-Australian accent as she takes the signed bill. This sort of thing always makes my day. We wander back out on to the ramp and preflight the plane. What follows — pretty much the entire flight back to Oakland — is a real world flight, for sure, but not what either of us planned for or really expected, and not (I'm sure) quite what Evan would have wanted as a first Real World IFR experience :-). Evan Pre-Flighting Cessna 83Y On The Ramp At Monterey. Back in 83Y Evan starts up and calls combined clearance and ground for our clearance. The controller sounds confused and not entirely on top of things, and issues us a standard VFR clearance out of Monterey's Class C airspace ("proceed on course…") rather than the expected IFR clearance back to Oakland. Evan questions the guy; he swears there's no clearance for our aircraft in the system. We swear. Now what?! We can certainly depart VFR towards the east at this particular time (ATIS is reporting marginal VFR, but there are no clouds at all past the departure end of 10R all the way to at least Nevada), but half the point of this flight is a real world IFR workout. We decide against pushing the issue with the Monterey controller — Evan's starting to suspect he put the wrong departure time in when he filed the flight plan, but I can't help wondering whether the controller's a trainee and just missing something — and plan on departing VFR to the east with flight following. We'll pick up a clearance from NorCal further along, probably somewhere near South County (E16). Oakland ATIS is still reporting IMC at Oakland, so we're going to need a real IFR clearance for the approach anyway unless it clears soon. So we depart VFR with Evan in the left seat; I'm just along for the ride until Evan dons the cone of stupidity nearer Oakland. On departure I look out over to the right at the old transient parking area — it's still physically there, but there are no aircraft parked there at all. The place looks dead; I don't know what the story is. The view's excellent, the air's smooth, I take a bunch of photos of all the interesting and bizarre sights on the ground, and things go pretty well until somewhere near Hollister. On NorCal's frequency we can hear a string of planes asking for pop-up clearances back into various Bay Area airports due to the long-lingering stratus, and a good proportion of them are being denied by NorCal with a simple "unable at this time". This doesn't sound promising, even if we're already in the system due to flight following, and especially since we have to have the plane back by 13.00. Evan wisely decides to put in an early request for the Oakland ILS 27R, well before South County. The good news is we're not immediately rejected (no "unable"); the bad news is we're not given any sort of clearance, either, just a variant of the usual "request on file" response. Better than nothing, I guess, and we press on. We can always land at Livermore (KLVK) if we can't get in to Oakland, and wait for the stratus to clear (which it clearly will, and soon), but that would mean blowing the return time. Oh well. At every hand-off Evan reminds NorCal of our request, and in each case we get pretty much the same response — either remind them again in a few minutes (which we do), or they're still working on it. At one point on air someone asks for "the approach" back into Hayward (KHWD, a little southeast of Oakland, at that time reporting the same sort of mild IMC). The pilot sounds confused and doesn't seem to know what he's asking for, but he also doesn't sound like a student; the controller keeps prompting him until it's clear he wants (or will take) the VOR approach. Sometimes I wonder why controllers put up with this sort of thing…. We can still hear pop-up requests being refused for other aircraft and airport combinations, so we feel pretty lucky that we haven't been completely rejected, but I start feeling edgy as we approach Reid Hillview (KRHV), the traditional decision point for East Bay airports when approaching from the south. The most annoying thing, though, is that although we can almost see the individual runways at Oakland from where we are (some thirty miles out at 4,500'), Oakland ATIS is still reporting IMC at the airport itself. We still need that bloody clearance, even though I'm betting we'll never see even a second of IMC on the way in, and we'll probably land in bright cloudless sunshine. But I was wrong about Monterey earlier, so I don't complain too loudly. Then out of the blue the NorCal controller asks us to "navigate towards SUNOL" (using that exact phrase). I like this sort of thing: an informal instruction that's basically saying something like "I can't give you a clearance right now or even vector you, but if you head off towards SUNOL [the traditional initial approach fix for many of Oakland's approaches] it'll probably make things much easier for both of us if I can suddenly slot you in". It's what we were going to do anyway, but it's a sign that things are progressing. Even so, I still feel edgy and worried that we might miss the boat or get lost in the rush. In the end although we don't get an actual clearance until we're turning onto the localizer, we're formally vectored for the approach well outside SUNOL, and Evan (of course!) flies the ILS 27R approach flawlessly back into Oakland under the hood. We didn't even get the NorCal slam onto GROVE several thousand feet above where we should be. In any event, we land dead on time for the next renters. And as predicted, while it's still supposedly IMC at Oakland, we never come close to even the smallest of clouds (because there aren't any, dammit), and we land in bright cloudless sunshine. Back in the office, as we're doing the club paperwork, we can hear Oakland ATIS still now reporting marginal VMC, on what's essentially a cloudless early-autumn day right across the Bay Area. Oh well. Welcome to the real world, I guess.